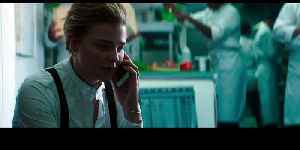 Greta: The Crazier They Are Clip - A sweet, naive young woman trying to make it on her own in New York City, Frances (Chloe Grace Moretz) doesn't think twice about returning the handbag she finds on the subway to its rightful owner. Greta: The Purses Clip - A sweet, naive young woman trying to make it on her own in New York City, Frances (Chloe Grace Moretz) doesn't think twice about returning the handbag she finds on the subway..
Greta: The Chablis Clip - A sweet, naive young woman trying to make it on her own in New York City, Frances (Chloe Grace Moretz) doesn't think twice about returning the handbag she finds on the subway..
Chloe Grace Moretz shares her story. Chloe Grace Moretz and Maika Monroe in this new clip from 'Greta', called "the crazier they are".